This 4,921 square foot, 3-story home has stunning views of upper Prior Lake. Custom tailored to its new homeowners, it’s the perfect blend of sophisticated glam and modern chic. With gray, black and white tones throughout, unique features were incorporated in each space to distinguish from the rest. This kitchen was designed with crisp white cabinets and black cabinet hardware. The industrial style appliances and paneled refrigerator are the perfect selection for the home’s overall style. Countertops are a white quartzite with Caesarstone gray quartz perimeter and classic subway tile backsplash. The cooktop area received special attention with a 40” flat screen TV designed to be mounted on the hood and vertical spice racks integrated into the cooktop bump-out hidden behind what’s normally identified as an island leg. Walking into the great room, your eye will immediately be drawn to the custom fireplace. The modern wood surround emphasizes clean lines and dimension with quartz surround inset to match the kitchen perimeter. 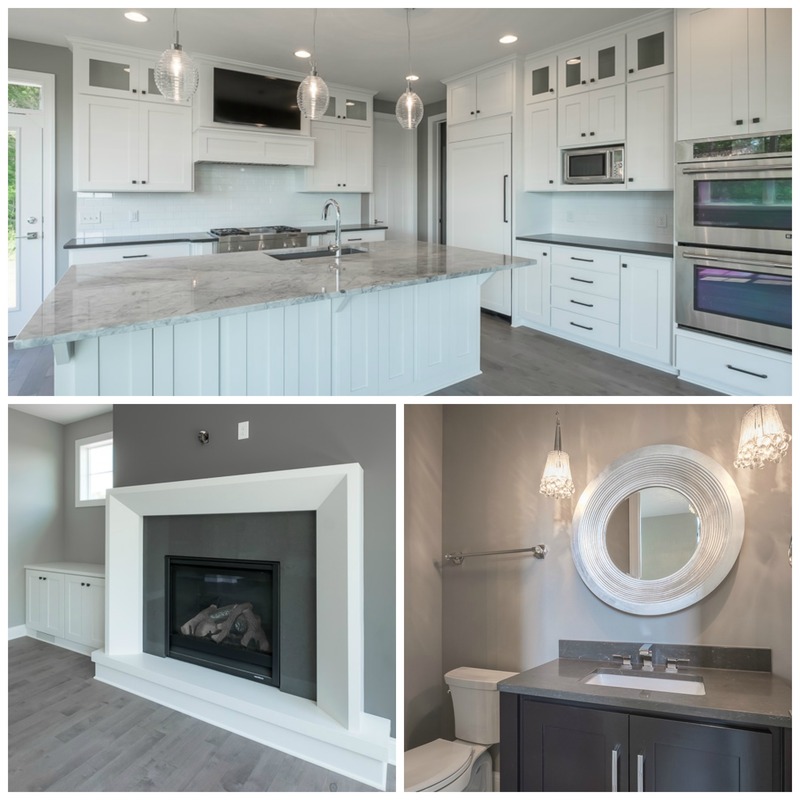 To continue to draw focus to the fireplace we painted the chase a dark charcoal gray and the wall with the base cabinets and transom windows a softer gray hue. The main floor powder room is a little slice of elegance. The black furniture style vanity accented with oversized polished chrome hardware gives this space a unique twist. Crystal pendant lights flanking the mirror add personality to the space while the gray washed oak flooring continuous into the powder room from the rest of the main floor tying everything together. This home is finished with His and Hers separate bathroom spaces integrated only by a large dual walk-in shower. Her space in full of glam with hints of sparkle integrated in the Silestone quartz vanity top and unique crystal lighting. A separate make-up vanity and free standing spa tub make this bath the perfect pampering space for any woman. His space is masculine with a lot of style! A crimson red vanity will grab your attention accented by the black lacquered mirror and stainless steel vanity splash. These are just a few of the unique features in this custom home. Overall, this home has a bold personality perfectly showcasing the homeowner’s style. Our custom homes are built to fit the needs of each individual homeowner so no two houses are alike. For more photos visit our photo gallery or inquire to info@homesbytradition.com.